It was the third day after the quake. Homeless people were flocking to the town where the school was located, most of the buildings were flattened and corpses scattered everywhere. The town resembled a battlefield. I was touched by the themes of the paintings drawn by the six-grade kids in the mountains. I carefully retrieved them from the ruins and decided to auction them, donating the proceeds to the suffering villagers and kids. Jao recently bought the first painting for 100,000 yuan ($14,490) at a charitable dinner organized in Beijing. And 10 days ago, Jao set up a micro-fund in his name to bring the various cultures together by improving English teaching in the school. We decided to let the locals have a decisive say on how the fund should be used. We let them frame the regulations on its management and application procedures for the teachers. And we are encouraging them to organize an “English Cultural Festival” every semester. We are also looking at more ideas on how the fund can be used. We will do every thing in a transparent way using the Internet. All documents and even minutes of meetings will be posted on a website. Apart from its cultural content, this approach is also about education. It is about transparency, vital during any stage of the post-quake recovery. I am shy of getting a little publicity in this cause. In reporting on disasters, journalists put themselves at great risk to get exclusive, real-time stories. But we must also put in that extra mile to help the victims. I still have more paintings in hand. I appeal for more efforts and innovative ideas to show our love and care for the people of Sichuan, especially those in the mountains. This is my first appeal: Help those in the mountains. 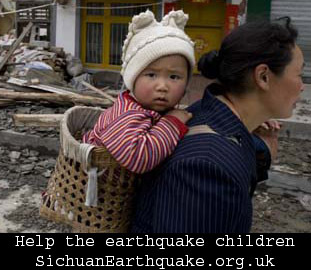 The earthquake brought massive losses to some cities but the villagers in the mountains suffered most. Most of the cities have highways making it relatively easy for aid and volunteers to reach them. This however, is not the case with some villages, still locked out. My second appeal is: Let your love be long lasting. The coming three years will be difficult, especially for those made homeless who will have to find a safe place to rebuild their homes. From the target perspective, my China Daily colleagues have voluntarily set an example: we have identified 30 poor families in Pingwu county of Sichuan and we 30 colleagues have helped them set up personal bank accounts. We directly deposit money into their accounts. It is a life-long commitment and we have promised to help the kids until they are 18. Of course, apart from the money, we are constantly communicating with the kids and their parents. This entry was posted on Tuesday, November 18th, 2008 at 2:14 pm	and is filed under News, Update. You can follow any responses to this entry through the RSS 2.0 feed. You can leave a response, or trackback from your own site. I am very moved by this article and I hope I can find some way to help with your efforts. My name is Steve Bindon, I am an English artist and I will come to China next month to make paintings of the nature and wildlife of China. I hope to visit Wolong to learn about the pandas and the indigenous people their. After reading your article on the paintings by the children I am trying to think if their is anyway i can develop an art project with the children. i think it can help to raise more awareness and funds as well as helping the children overcome trauma through art. i would also like to make paintings of some of the children if i can. We can then use these paintings of mine and the children in a combined exhibition to raise more money for them. Please let me know your thoughts on this please. i hope there is something I can do. It’s going to be end of mine day, except before ending I am reading this impressive piece of writing to increase my experience. I am glad for writing to make you understand what a incredible encounter my princess enjoyed going through your blog. She mastered such a lot of pieces, which included how it is like to have an excellent teaching mindset to have certain people without hassle completely grasp selected specialized subject matter. You actually exceeded readers’ desires. Thank you for delivering those good, healthy, educational and also easy thoughts on the topic to Emily.